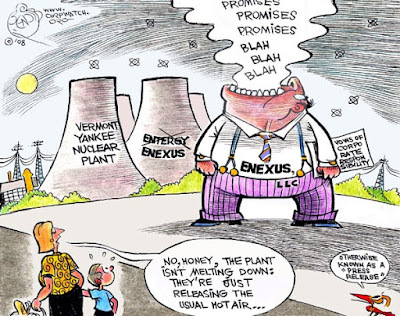 Entergy is the fat corporation owning Pilgrim Nuclear Power Station in Plymouth, Massachusetts. They've sucked revenues from the nuclear reactor, but have no proper plan for dealing with the dirty aftermath. Now they suggest selling the aging plant to another (newly formed) corporation. 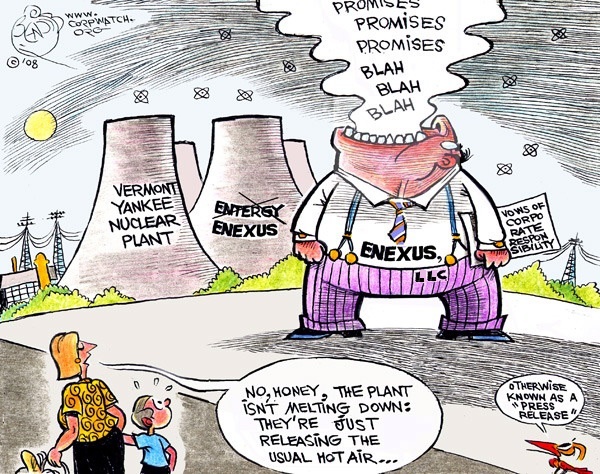 A similar process is happening at the Vermont Yankee Nuclear plant. There's no reasonable vision for optimism. Entergy would exploit profitable decommissioning, if there were such a thing. They instead plan to wash their hands by passing the muck to a newly-formed shell corporation. This new firm may perform correctly, but tens of millions, maybe billions of dollars urge them to default, defect, and pass most costs to the public. Don't let Entergy off the hook for their obligations.